The LO-N2 Low Pressure Alarm Gauge is a general purpose 0-4000 PSI gauge suitable for use with Nitrogen. 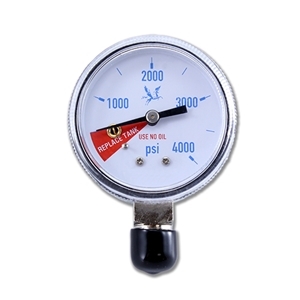 This gauge will alarm both visually and audibly when pressures falls below 500 PSI (+/-150 PSI). Gauge has a 2" face and 1/4" MNPT connection.